This year’s BFI London Film Festival will include the UK’s biggest ever season of film and television celebrating black actors. New film Paddington will have its world premiere in the capital this afternoon, after it was controversially given a PG rating for sexual references and dangerous behavior. 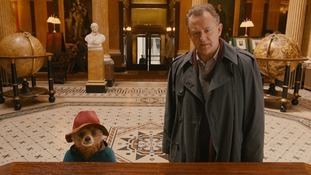 Stars will be at the Odeon Leicester Square for the first showing of the movie, which follows the comic misadventures of Paddington, who travels to London in search of a home. Ben Whishaw voices the Peruvian bear in the live-action film, which also stars Hugh Bonneville, Peter Capaldi, Julie Walters and Nicole Kidman. ITV London will be at the premiere. Don't miss Helen Plint's report at 6.30pm on ITV1. A film claiming to tell the true story of the man who once owned most of Soho has its premiere in London tonight. Steve Coogan stars as Paul Raymond, the man who built an adult entertainment empire. Lucrezia Millarini's reports contains some flash photography. Young people from the SPID Theatre Company in Kensington and Chelsea have won the Best Animation award at the First Light film awards held at the Odeon in Leicester Square today. Their film 'High Above the Sky' was put together by a group of 58 young people. Rags Martel also asked James McAvoy about Trance, a thriller directed by Danny Boyle that is due out at the end of this month, and about taking on the role of Macbeth in the West End. The actor is currently starring in the Shakespearean tragedy at the Trafalgar Studios. Last year the London cityscape provided a stunning backdrop to the latest James Bond film Skyfall. But now there's a new movie in which the capital plays a starring role. Welcome to the Punch is a crime thriller filmed in places like Canary Wharf and the east end. Rags Martel has been to speak to actor James McAvoy about the film. Film producer and movie studio chairman Harvey Weinstein has been speaking to ITV Daybreak about his BAFTA success, picking up three awards at last night's awards. He said the movie industry was like playing sports "I don't think you get tired of playing, and if you're on a winning team now and again it certainly rejuvenates you." The Weinstein Company produced Silver Linings Playbook, which won best adapted screenplay. Both its stars are nominated for Oscars in two weeks time. Skyfall helped James Bond pick up his first BAFTA in more than fifty years last night, the film won Outstanding British Film at the awards ceremony. The Best Film award went to Argo, picking up three awards in total. ITV Daybreak's Louisa James reports. Argo was the big winner at the Bafta awards, scooping Best Film, Best Director for Ben Affleck and Best Editing. The director and producer Sir Alan Parker has been awarded the 2013 Bafta Fellowship, the final award of the night. Sir Alan, who made films including Evita, Midnight Express and Bugsy Malone during a long career, said the award was "incredibly flattering". He said: "When you're halfway through your first film you're sure it's going to be your last then you blink and 40 years have gone by and you've made 14 films." Is Adele's new Bond theme a classic?